On January 26, 1990, Elaine Weddington Steward was promoted to assistant general manager for the Boston Red Sox. She had been working with the franchise since 1988 as an associate counsel. Her promotion in 1990 made her the highest-ranking black female executive in Major League Baseball. The television series Pitch aired on Fox in 2016, and I watched it perhaps a year later. I have been meaning to write about it here ever since, but I think the delay has been largely due to debating how I would approach this thing. When I watched Ken Burns’s Baseball documentary series, I wrote about it one episode at a time. However, each episode of that series is approximately two hours long and crammed full of information. Pitch, meanwhile, is more of a standard television drama. A separate post for each episode seems excessive. However, a really long, single, detailed post also seems excessive, so this is going to be quite the Reader’s Digest summary. The series revolves around a character named Ginny Baker, who becomes the first woman to play Major League Baseball. In the first episode of the show, Ginny makes her Major League debut with the San Diego Padres. Though her first start goes terribly, the team opts not to send her back to the minors because they realize that having the first woman Major Leaguer is quite a draw for crowds (it’s always about the money, right?). Fortunately, Ginny manages to recover from her stumble, and thus, the series takes off. Ginny’s father, Bill, is the one who not only taught her to pitch, but who also drove her to become good enough to go pro. We learn early on, however, that Bill actually died years ago in a car accident, right around when Ginny was first drafted by the Padres organization. His lessons and his death continue to haunt Ginny throughout the series. Ginny’s relationship with her father is only one of many conflicts throughout the show. Pitch goes out of its way to try to accurately depict what it would really be like if a woman were to break into the majors. Ginny deals with an immense amount of pressure in this role, not just through her performance on the diamond, but also in being put up on a pedestal as a role model for girl athletes. Through all the publicity, Ginny’s primary goal with the team is to be accepted as one of the guys. We also see drama surrounding the All-Star Game, the trade deadline, the relationships between Ginny and her agent and between Ginny and catcher Mike Lawson, relationships between other players and with their families, and conflicts arising due to Ginny’s brother, Will, trying to capitalize on his sister’s fame. Once I started watching this series, I was instantly hooked. I rarely binge-watch anything, but I blew through every episode of Pitch in about two days. The show does a tremendous job of drawing viewers into the stories surrounding each of the characters, and it throws in enough baseball to give satisfaction to baseball fans. My only complaint about this show is that it did not get renewed for a second season, leaving so many questions hanging unanswered and the story unfinished. On March 20, 1934, female golfer and Olympic track and field gold medalist Babe Didrikson pitched the first inning of the Philadelphia A’s spring training game against the Dodgers. 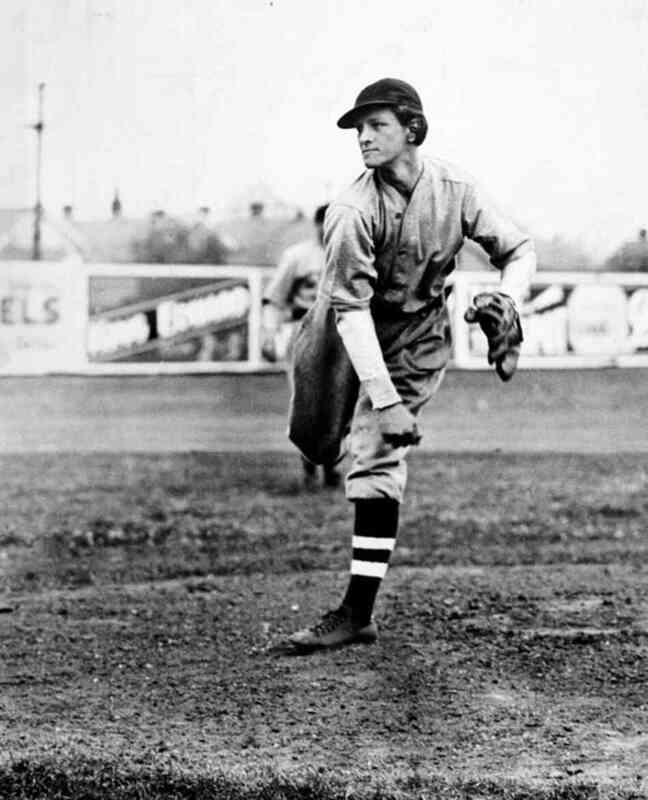 In the outing, Didrikson gave up no hits and only one walk at McCurdy Field. Didrikson would also make appearances for the Indians and the Cardinals. Here’s a poem out of a book that a close friend gave to me a few years ago. The book is Diamonds Are A Girl’s Best Friend: Women Writers on Baseball, edited by Elinor Nauen, and it is a collection of stories, poems, essays, and memoirs about baseball written by women. I love the layers of meaning in this piece. And you said: that’s it. Thanks to the 1992 comedy-drama, A League of Their Own, how many of us have not heard this classic line? The movie dramatizes for us the story of the All-American Girls Professional Baseball League. When World War II broke out, and many of the men in Major League baseball were called to away to serve, the prosperity of professional baseball was threatened. In order to keep the sport alive (and to salvage some lost profits), baseball owners created the AAGPBL, scouted women players across the country, dressed them in skirts, and sent them out to play ball. However, women’s involvement in baseball existed long before World War II. In New York and New England, baseball was being played in women’s colleges as early as the mid-nineteenth century. In 1867, Philadelphia played host to an African-American women’s team, the Dolly Vardens. One great story you might have heard involves Jackie Mitchell of the Chattanooga Lookouts. As a pitcher during an exhibition game in the 1930s, Mitchell struck out both Babe Ruth and Lou Gehrig. Unfortunately, this event was quickly promoted as a mere publicity stunt, rather than a serious effort on the parts of Ruth and Gehrig. Today, there persists a distinction between baseball as a male’s game and softball as a female’s game, but this separation did not exist until the 1890s when softball was invented. For three decades prior to this, however, women played baseball, even as baseball leaders like Albert Spalding promoted it as a “manly” or “gentleman’s” game. No doubt they looked ridiculous, as the uniforms of college women ballplayers consisted of baseball caps and full-length dresses, but women loved playing the game and they proved themselves to be just as competitive and physical as their male counterparts. Unfortunately, society considered it too strenuous and unhealthy for women to engage in too much travel or competition, and as a result, women’s college baseball was confined to existing as an intramural sport, rather than an intercollegiate one. As a result of the sexism of the period, from males and females alike, women’s attempts to establish themselves in baseball were doomed to failure. As fans, however, the presence of women at baseball games was often encouraged. It was believed that the presence of women would help to discourage the fighting and cat-calling that sometimes happened at the ballpark. In the late-nineteenth century, Ladies’ Day promotions came into being, in an attempt to attract women fans to games. By 1900, middle-class women were attending ballgames throughout the country. In 1909, the National League, convinced that women had become sufficiently interested in the game to start paying for admission, brought an end to the Ladies’ Day promotion. While the creation of the All-American Girls Professional Baseball League was certainly a breakthrough for women in the sport, baseball owners made it clear that the league was only temporary, and there was to be no question that those who played were women first and baseball players second. From the short skirts and team names to the mandatory chaperones and strict rules on the women’s behavior, every measure was taken to reassure the public and the girls’ families that their femininity would remain intact. The sport of softball continues to flourish today, but questions continue to circulate about its impact in perpetuating sexist stereotypes. The common belief is that due to the physical differences between men and women, confining them to separate sports helps to maintain a fair playing field and protects women from needless injuries. But when you think about it, baseball is a game that requires coordination, timing, knowledge of the game, control, and competitiveness — all characteristics that are not exclusively male. Sure, perhaps strength and size can be useful assets, but even male players like Ichiro Suzuki have proven that they are not absolute essentials to being successful ballplayers. And I know from personal experience that, out of the playing field, girls can be just as brutal and ruthless as the guys, if not more so. After all, baseball is considered to be “America’s Pastime,” and as the AAGPBL Victory song points out, “we’re All-Americans” too. Frommer, Harvey. Old-Time Baseball: America’s Pastime in the Gilded Age. Lanham: Taylor Trade Publishing, 2006. Gems, Gerald, Linda Borish, and Gertrud Pfister. Sports in American History: From Colonization to Globalization. Human Kinetics, 2008. Heaphy, Leslie. “Women Playing Hardball.” Baseball and Philosophy: Thinking Outside the Batter’s Box. Ed. Eric Bronson. Chicago: Open Court, 2004. pp. 246-256. Riess, Steven A. Touching Base: Professional Baseball and American Culture in the Progressive Era. Westport, Connecticut: Greenwood P, 1980. Ring, Jennifer. Stolen Bases: Why American Girls Don’t Play Baseball. U of Illinois P, 2009.